In my classes, I like employing strategies that promote deep reading. I started using Hypothesis in one of my graduate classes this semester to help students connect with concrete quotes from the text while also analyzing and reflecting on them. This system has the additional benefit of holding students accountable to engaging with the assigned readings. Annotating with hypothesis also offers a social component, one that extends the discussion of course materials outside of the classroom. Mia C. Zamora, an Associate Professor of English and Director of the Kean University Writing Project, explains that tools like Hypothesis “extend the discursive space of the classroom” which “facilitates engaged reading practices.” She continues, “A collaborative reading environment seems to me a fair foundation for dynamic and thoughtful interaction, which, in turn, holds the potential to mirror the kind of rich and complex dialogue we aspire to in a working democracy.” So far, I’ve found this tool to promote thoughtful student engagement with class texts while also sharing thoughts and ideas with each other and with me prior to the start of class each week. You can use Hypothesis in a browser — either as a Chrome plug in or via a link “preface” (a snippet of a link that you add onto the web address you want to annotate). The browser version works well for readings that are websites, blog posts, and PDFs online. There’s also an LMS version that you can add to Canvas, Blackboard, and other LMS systems. If you have a lot of scanned PDFs that are not available freely online, this is a good route to take. 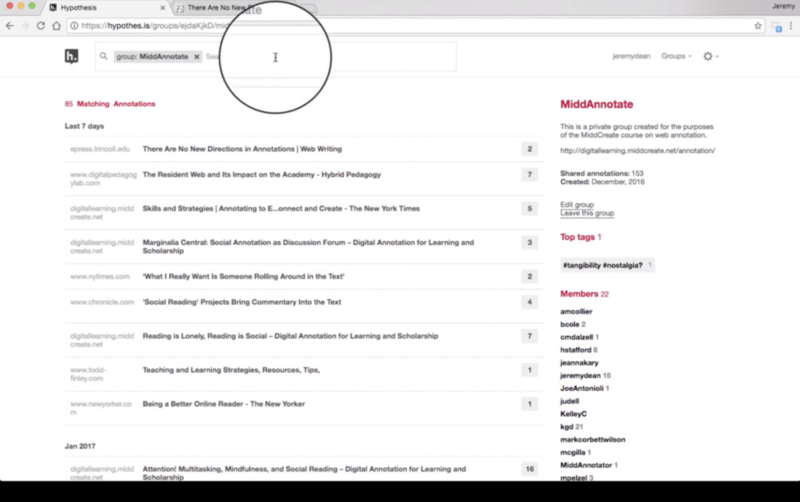 A different tool, Perusall, allows students to annotate e-books/e-textbooks, although the selection of texts is limited. Hypothesis allows editing in public, in private groups, or privately. I use a private group to create a class-specific space where we can engage with each other without having to filter out comments left by others. A private group also provides a space with greater safety and comfort — students don’t have to craft comments that will hold up to public scrutiny, and so typos, errors, and questions are okay! There are four types of annotations on Hypothesis: highlights (these are private within a group), annotations (highlighting text + commenting), page notes (commenting on the page without highlighting), and replies to annotations and page notes. The Hypothesis sidebar (shown below) can be minimized (click the arrow on the top left of the sidebar) or resized (click the arrow and drag to resize). In the sidebar, you can see the group you are viewing in the middle of the top bar (in this case, HS7310_2019), and clicking the arrow to the right of the group name changes your view (other options include public view or other private groups you belong to). The sidebar shows your own comments and highlights (both private and those shared with the group) and all annotations and page notes your students have shared with the group. 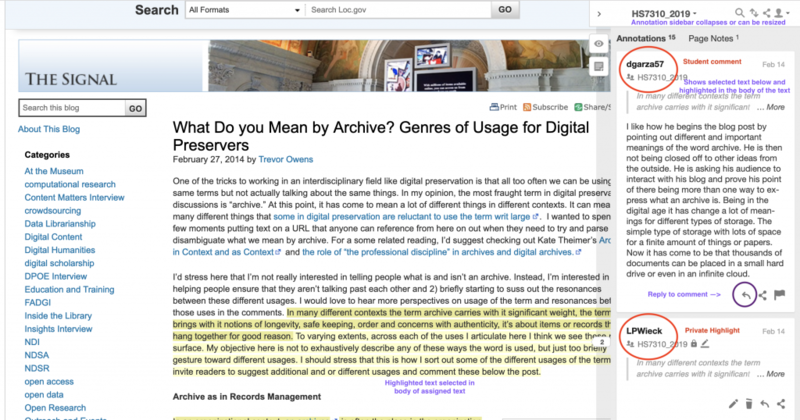 This screenshot shows how annotations appear as highlighted text in the main body of the reading, and as comments or highlights in the Hypothesis sidebar. The sidebar can be resized or minimized. Either download the Chrome Plugin or save the Hypothesis Bookmark. Create a Private Group for your class. Copy the Group Link to share with your students. Students should register for Hypothesis. Share the Group Link with students so they can join the group. Here’s one example of the type of instructions you might give your students, and here’s another. Remind students to be attentive to logging into the hypothesis tool and making sure the class group is enabled. Otherwise, it’s easy to accidentally post comments in the public side of hypothesis where the group will not see it. Within the group, it’s also important to post to the whole group vs. leaving private comments. Highlights and private comments within the group can only be seen by the individual who made them. So how do you assess comments on Hypothesis? I typically assess based on completion. My graduate students, for example, typically read about 7-10 items per week in a Digital Public History class. I ask them to leave a minimum of about 75 words of annotations per reading, and this could take the form of one long comment or two shorter comments. Each week these assignments make up about 2% of each student’s total grade, eventually totaling more than 20% of their final grade. I do not read every comment, but I do read several by each student each week so that I can provide feedback as needed. I also enjoy reading the comments while I read and prepare for class. Here’s the workflow I use to assess students: I log into hypothesis, click groups in the upper right corner, and select the class I’m assessing. This takes you to a group page for your class, which looks something like this (see also the screenshot below). On this page, you can see the aggregation of posts your students made WITHIN THE GROUP. (It does not show you their highlights without annotations, private posts to themselves, or comments they accidentally made OUTSIDE the group.) This page is a great way to quickly gauge class thoughts before or during class since they are sorted by reading (left column in screenshot below) You can also click on each student’s name on the right column (“Members”) to see just that one student’s comments. By selecting each student individually, I can count their comments, briefly skim them, and pick a few to read in depth. Integrate Hypothesis into your LMS: You can integrate Hypothesis into your Learning Management System (e.g. Canvas, Blackboard, etc.). This is a great option if your class reads a lot of PDFs via your LMS. 10 Ways to Annotate with Students: This suggests types of annotation that students can do, including doing close reading, doing multimedia analysis by integrating images and videos into annotations, asking questions about the reading, or answering questions pre-composed by the instructor. Jeremy Dean and Katherine Schulten, “Skills and Strategies | Annotating to Engage, Analyze, Connect and Create,” The New York Times: Like the link above, this shares additional ways to frame annotation assignments, like annotation as argument, annotating current events to add context and enrich background knowledge, and annotating to make connections. 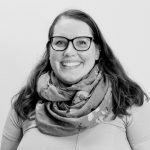 Teacher Resource Guide: Hypothesis’s curated links for teachers including student examples, assignment examples, and blog posts & webinars. Hosting & Annotating PDFsand Really, You Can Annotate Anything:: Tips on turning books, journal articles, and other text into text that can be highlighted and annotated. The Pedagogy of Collaborative Annotation: a webinar that includes topics like encouraging student collaboration, scaffolding annotations, annotation assignments and rubrics, and more. If you give Hypothesis Annotations a try, please stop by and comment or email me how it goes for you!